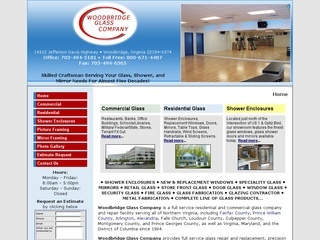 Woodbridge Glass Company is a full service residential and commercial glass company and repair facility serving all of Northern Virginia, including Fairfax County, Prince William County, Arlington, Alexandria, Falls Church, Loudoun County, Culpepper County, Montgomery County, and Prince Georges County, as well as Virginia, Maryland, and the District of Columbia since 1964. Woodbridge Glass Company provides full service glass repair and replacement, precision glass cutting, glazing glass contractor, precision mirror cutting, glass service contracts, and custom shower enclosure systems. We have a large state of the art shop where our technicians craft their products right on the premises using sophisticated machinery, and a large warehouse area that stocks just about any product you can think of that relates to glass, showers, windows or mirrors. Please visit our showroom today! "14312 Jefferson Davis Highway Woodbridge, Virginia 22194-0374"